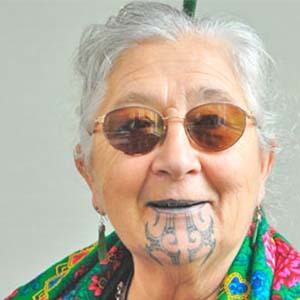 Pauline Tangiora is a Maori elder from the Rongomaiwahine Tribe on the North Island of Aotearoa (New Zealand). Deeply rooted in the ancestral wisdom of her Peoples she has devoted her life to environmental, peace and Indigenous rights work, both at home and around the world. Since she was a child, Pauline has felt called to stand up for others. During the Vietnam War, she became involved in the peace movement, “keeping my eyes and ears open, writing letters to MPs, annoying anybody involved.” From there, Pauline began to work in the prison system, volunteering with the Maori Women’s Welfare League, helping to get books to prisoners, and shedding light on the damage done to Maori children who have been in state care. She has travelled throughout the world communicating the ancient wisdoms of Indigenous Peoples. Her international work includes helping the San people in the African Kalahari preserve traditional places and cultural heritage; campaigning alongside environmentalists in Brazil for the protection of water; standing with Indigenous people in Mexico, as well as in solidarity with those at Standing Rock, USA; helping the Australian Aborigines revive a lost ritual with whales; and travelling with a peace caravan through North America in order to draw attention to the plight of Indigenous people in the South Pacific. Among her numerous positions and affiliations, Pauline has been a Justice of the Peace, President of the Women’s International League for Peace and Freedom Aotearoa, Regional Women’s Representative for the World Council for Indigenous Peoples, Earth Charter Commissioner, Ambassador to the Earth Council International and to the 13 International Indigenous Grandmothers’ Council, a member of the World Future Council and the Maori Women’s Welfare League, and a Patroness of the Peace Foundation. She was also a consultant to the International Steering Committee of the World Court Project. Pauline is known affectionately as Nanny Pauline or Aunty Pauline. She and her husband have a blended family: they have 14 children in total, 8 of them are theirs and 6 are her cousin’s. She has 52 grandchildren.